Sotheby's, London, 20 April 1982, lot 83. Christie's, New York, 21 March 2002, lot 72. Arts of Asia, July-August 1982, p. 133. Chinese Snuff Bottles, Taipei Gallery, New York, October 1993, p. 13. This bottle is one of a pair in the Meriem collection, part of the famous set of eight bottles discussed by Moss et al. in The Art of the Chinese Snuff Bottle, pp. 366-7, nos. 212 and 213, where one of the four pairs is illustrated (one of which was sold in these rooms, 22 March 2007, lot 25). Apart from the two in the Meriem Collection, two are in the Bloch Collection (having been acquired originally by Galia Baylin and thence, via the Belfort Collection), illustrated by R. Kleiner, Chinese Snuff Bottles from the Collection of Mary and George Bloch, pp. 164-5, no. 222), and two were in the Stempel Collection (sold, Sotheby's PB84 New York, 11 October 1979, lot 63). They probably all came out of China in the 1960s and were split up into pairs, and acquired for four prominent Hong Kong collections. 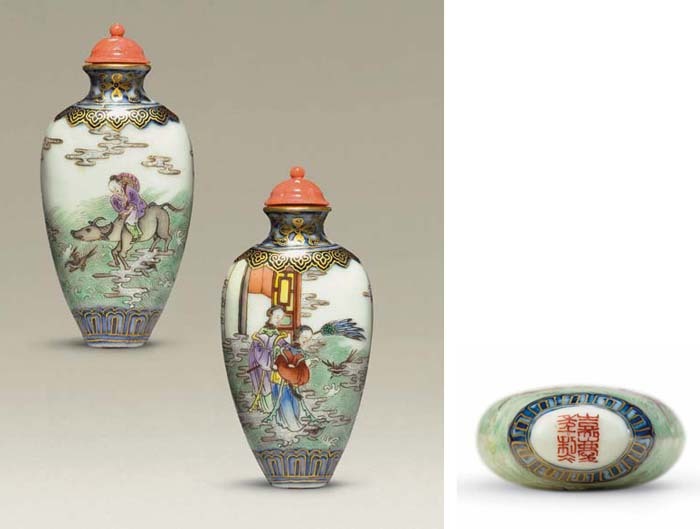 These eight bottles are amongst the finest and most exquisitely enamelled of all Jiaqing Imperial porcelain snuff bottles, painted in bright, crisp enamels and of extremely elegant form. Boxed sets of such bottles would have been ordered at Jingde Zhen during the late Qianlong and early Jiaqing period, to be distributed as gifts on various occasions. This set appears to be unique in that the shapes, border patterns and marks are identical, but each has a different subject. The subject is the celestial love story of Niulang the Herdboy and Zhinu the Spinning Maid, who represent the stars Vega and Altair in the heavens. The two sweethearts married and were so infatuated with each other that they neglected their duties. The Queen of Heaven became angry and with a bold stroke of her silver hairpin, drew a line across the sky which became the Milky Way, and the Herdboy and Spinning Maid were separated from each other. Their anguish was so great that the King of Heaven took pity and granted them a visit one night each year. On the seventh night of the seventh month, magpies fly together to form a bridge for the lovers to cross.